Published: May 23, 2013 at 11:41 a.m. Updated: May 28, 2013 at 06:01 p.m. The news coming out of San Francisco was jarring and sobering. Michael Crabtree tore his Achilles tendon in organized team activities on Tuesday and quickly had surgery to repair it. While 49ers head coach Jim Harbaugh told the media on Wednesday that he doesn't anticipate the injury will be season-ending, it is a huge blow. Harbaugh confirmed it was a complete tear. And based upon precedent of players coming back from this injury, chances are the Niners can't count on Crabtree contributing anytime soon. When you get past the jolt of San Francisco losing its top receiver -- a budding star at arguably the only position in which they are thin -- you must keep perspective. 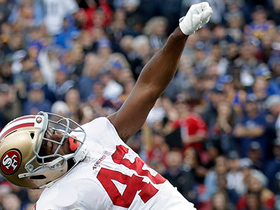 Jim Harbaugh's 49ers know how to deal with injury and adversity. Jim Harbaugh's 49ers are still the best team in the NFL, the team to beat in 2013. Now I don't want to minimize things -- this injury is a major deal. Crabtree is a gifted, freakish athlete who became Colin Kaepernick's favorite target once the second-year man took over at quarterback. Crabtree posted career highs in catches (85), yards (1,105) and touchdowns (9) last year, and was dominant in the second half of the season and postseason. We're talkin' big-league production. He was clutch, too. In his fourth NFL season, Crabtree finally became the true beast and weapon San Francisco desired when it took him with the No. 10 overall pick of the 2009 NFL Draft. And it was easy to look into the crystal ball and project even bigger and better numbers, given his budding rapport with Kaepernick. Plus, factor in the free-agent defection of one of my favorite players in the league, Delanie Walker. The do-it-all clutch weapon fled to Tennessee for a bigger role. Bottom line: This injury hurts. One general manager who has San Francisco on his team's schedule told me Thursday morning, "It is a big loss. I'm not sure if (Crabtree) has fully grown up, but he has improved significantly on the field." And another general manager used the exact same words in his explanation, "It is a big loss. Not sure of their replacement plan. Suffice it to say they are a solid team. There are builders there, and they will take care of their business." Yes, thankfully for the Niners, they traded for Anquan Boldin. Now, Boldin and Crabtree are obviously different players at different ages. But regardless of his advanced age and modest foot speed, the wily Boldin is a big-game player who knows how to make plays, catch the football and come through on third down/in the red zone. Joe Flacco was at his best this past postseason when Boldin was heavily involved. Kaepernick will fall in love with his new target and use him as a security blanket. Meanwhile, Vernon Davis is still one of the best pass-catching tight ends in the league (though he did seem to click more with Alex Smith). 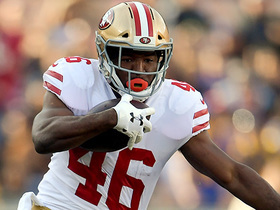 One player the Niners need to step up: A.J. Jenkins. I was stunned when they picked him in the first round of the 2012 NFL Draft. San Francisco is an excellent organization, but I said at the time the pick was a major reach, with some executives telling me they had a third-round grade on the Illinois product. Jenkins has spent the offseason working with Kaepernick. That should help, but he has something to prove after an invisible rookie season. Mario Manningham is coming off major knee surgery last winter and is not expected to be ready for training camp. Even with a healthy Crabtree, the wide receiver position was an area of concern for San Francisco. But you must take into account the rapid growth, arm strength, foot speed and savvy of Kaepernick. He's only getting better and makes everyone around him better. Harbaugh is a quarterback guru, and Greg Roman is one of the best offensive coordinators in the game. 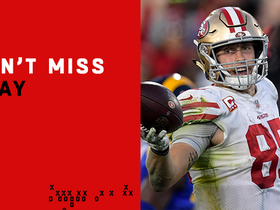 Most importantly, Harbaugh's Niners will always be a power team on offense. They have the best, most complete and strongest offensive line in the game. That can't be ignored. Frank Gore is still a sturdy back. I think the development of LaMichael James as a runner -- and now as a receiver out of the backfield -- is huge for San Francisco's success. The hope is Kendall Hunter comes back strong from a torn Achilles of his own. On the other side of the ball, the Niners are absolutely loaded. And this remarkable defense starts with a stellar group up front. Justin Smith will be healthy for the start of the season. Harbaugh told the media on Wednesday that Smith is shining in the weight room. When healthy, he is one of the most dominant and versatile defenders in the game. Aldon Smith slumped down the stretch and in the postseason -- thanks in large part to Justin Smith's injury -- but he's a true sack artist. Ray McDonald is one of the most underrated defensive linemen in the game. NaVorro Bowman and Patrick Willis form the best linebacker combo in the league. And Ahmad Brooks was a true playmaker last year. The defensive backfield is solid. Nobody should be surprised when Nnamdi Asomugha becomes a player again, finding stability by the Bay. I loved the draft selection of Eric Reid to replace Dashon Goldson. Don't worry, Dennis Green -- I'm not crowning the Niners. The Seattle Seahawks are well-rounded and dominant. The Atlanta Falcons are dangerously close. The Green Bay Packers employ Aaron Rodgers. I think the competition in the NFC is incredible. I think the NFC West is the best division in football. The St. Louis Rams are strong, well-coached and could be a sleeper. The Arizona Cardinals will be vastly improved. But let's remember how things played out last year, starting with Smith getting hurt and then losing the starting quarterback gig. Harbaugh always puts the media emphasis on himself. While he rubs folks the wrong way, he is a genius like that. Yes, Jim Harbaugh is a genius. The antics aid his players in dealing with adversity. 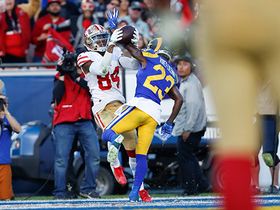 They dealt with injuries to their starting quarterback, a key receiver (Manningham) and arguably their most important defender (Justin Smith), falling just a few yards short of a Super Bowl title. Losing Crabtree is a big deal, but I'd still rank San Francisco No. 1 in a Power Rankings today. The 49ers ooze talent and can take a punch.